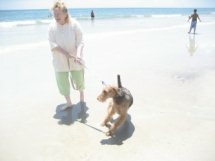 On Flagler Beach with our beloved Airedale, Breanna. This was her first time at the Beach and she was NOT impressed. it is a pseudonym used at WordPress/Twitter for my Gravatar. Am finally learning my way around Twitter. Please feel free to follow, I promise to follow you back! My Airedales, Endangered Wildlife, Florida’s Natural Beauty, The Environment, Anthropology, Global Culture, Global Human Rights, Native American Culture, Mahatma Gandhi, India, The Dalai Lama, Tibet, Monks, Aung San Suu Kyi, Myanmar, Nelson Mandela, South African Democracy, Cesar Chavez, Farm Workers Rights, Yellowstone National Park, Jackson Hole, The Tetons, The Black Hills of South Dakota, Protecting Bison, Petroglyphs, The Lake Wales Ridge, The Florida Keys, Key West. Gandhi, Invictus, Seven Years In Tibet, The King’s Speech, The Blind Side, Stand and Deliver, Ishi: The Last Yahi, Avatar, Love Actually, The Replacements, Crazy From the Heart, Fool’s Rush In, All The President’s Men, The Birdcage, The Candidate, Shawshank Redemption, A Time To Kill. U2, John Cougar Mellancamp, Billy Joel, Phil Collins, John Denver, Queen, Blondie, Gloria Estefan, Michael McDonald, Paul Simon, Bruce Springsteen, Karen Carpenter, Trans Siberian Orchestra. Gandhi’s Autobiography: An Autobiography-The Story of My Experiments with Truth, Mary Leakey’s Autobiography: Disclosing the Past, The Riverside Shakespeare, All of My Anthro, Native American and Geology Books. Caught up to you through a link you left on Harman on Earth. While I have scant hope for us coming to a sense of accountability for our damages against nature – and ourselves by extension – it’s good to know the passions and persistence of folks like you and Greg Harmon are not giving up. Your hearted, authentic efforts are greatly admired and appreciated. Thank you so much for your kind thoughts and support. Together we CAN stop the evil against animals everywhere! Such wonderful work you do–thank you. And thanks for stopping by eve’s apple! Thank you for your kind words Marisa! Hello, i enjoy your Blog! Makes me feel better, to know there are ppl out there that are concerned. It feels lonely. I have a digital magazine we do ‘t print for obvious reasons, if you feel you would like to send us some of your articles we will be glad to publish them! Thank you! Thank you for your invitation and kind words. As we follow each other on WORDPRESS, please feel free to “REBLOG” any of my postings you feel are something your readers may like. Ok, I see you called me, just got home will call you back soon. I will reblog this article! Thank you for caring, we all must try to do something! Thanks for stopping by my blog. Glad you enjoyed the piece about Close Encounters. Seems we have a few interests in common, e.g. Jackson Hole and the Tetons, All the Presidents Men. Hope you’ll continue to visit my blog in future and comment if you wish.. Thank you for your presence and kind words. Yes those places and things are very close to my heart! Thank you for coming here and sharing your beautiful thoughts. Your words, your writing, and your poetry are without equal. I’ve been following your blog for a long time now. =3 You’re amazing! You are very sweet and thank you, very kindly for the thoughts. That is good, I am always afraid to hurt anyone’s feelings over this decision. Would you please do come here, to my other Blog and see the wonderful people that have been written about, including, of course, Gandhi! Am doing so – right now! 🙂 So happy to discover you! Have really enjoyed your Blog. We have many common thoughts! Delighted to have discovered you here. Looking forward to much exploration. Regards from Thom at the immortal jukebox. The feeling is mutual Thom! I’m glad you liked it. Thank you for visiting. have very little time for WP right now. I truly appreciate your sweet thoughts!!!! Feeling the love and am embracing it…..
as my time online is very limited now. Found your blog and thought I would have a look, great work, Have you seen the Aussie crocodiles, not “Croc dundee” but the real ones. We quite often have constant disputes over them. Fresh water ones and the ones that come in from the ocean. Thank you for the links. They were awesome! You had me at Hoosier raised! What part of Indiana? Look forward to reading more of your site and your activism! Dear James. Thank you for the kind and supportive words. Happy building and be safe!